Tone Software, a leading provider of comprehensive unified communications and collaboration (UC&C) monitoring and management software for advanced collaboration ecosystems announced the ReliaTel UC Service Assurance solution now incorporates Netflow-based data analysis to drive expanded monitoring, thresholding, graphical dashboards, and extensive performance reporting. Using the Netflow protocol, ReliaTel delivers deeper insight into UC quality and network utilization based on analysis of the specific applications, users, protocols, and flow conversations that generate traffic on the UC&C network. Networking devices from leading vendors such as Cisco, Juniper and Extreme underpin a large portion of today’s UC&C infrastructures, comprising much of the necessary transport layer for premise, hybrid, and cloud-consumed communications. An abundance of these devices are Netflow capable, providing granular metrics on UC network utilization, traffic destination, and bandwidth consumption by voice, UC and collaboration applications. The enhanced ReliaTel NetFlow facilities now incorporate this valuable intelligence into the already robust set of deep UC and QoS metrics analyzed by ReliaTel, providing UC teams with deeper insight into the cause of network congestion and the specific traffic competing for resources. “The ReliaTel Flow capabilities eliminate the cumbersome burden of using command line queries to access Netflow analytics, incorporating those critical metrics within the overall context of the ReliaTel UC Service Management solution,” stated Paul Wiggins, director of UC strategies for Tone Software. “As a result, UC teams gain much deeper visibility and are better equipped to effectively manage the health, quality, and performance of their communications services,” he concluded. ReliaTel’s Flow capabilities deliver proactive monitoring and thresholding based on Netflow values, providing UC teams with advance warning of developing network congestion and excessive bandwidth consumption. Using the ReliaTel dynamic graphical Flow Dashboards, UC staff can easily visualize trends for Flow volume, speed, and utilization by top IP addresses, applications, protocols, and conversations, to better understand UC network resource conditions. Further, an extensive set of over 20 different ReliaTel Flow Reports are available to assist teams in identifying network resource contention, capacity planning requirements, and network utilization patterns that can be optimized to better meet business objectives. As demand for unified communications and cloud communications steadily increases, Providers can readily leverage ReliaTel to better manage their UC service delivery operations, and ensure the customer experience they provide meets expectations. ReliaTel is available as a cloud-based solution, delivering full UC&C quality and service management from an economical and efficient cloud host. The ReliaTel as a Service solution benefits include rapid deployment, reduced operational overhead, and a pay-as-you-go consumption model. Further, ReliaTel provides multi-tenant support that fits the Providers’ business model perfectly, empowering Providers to better engage their clients, win more deals, reduce churn, and increase service profits through cost effective, customizable, cloud-based ReliaTel UC service management. 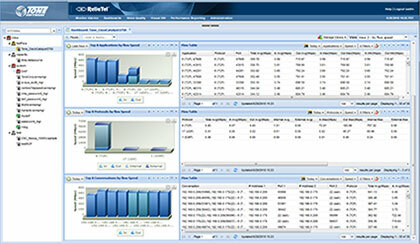 The enhanced ReliaTel Netflow capabilities are available immediately. Contact Tone for further information – email info@tonesoft.com or call 714-991-9460. Tone Software Corporation is a global provider of comprehensive monitoring and management solutions for advanced communications and collaboration ecosystems. Tone’s ReliaTel provides managed service providers (MSPs), UC as a Service providers (UCaaS), value added resellers (VARs), and enterprises with a unified approach for managing and monitoring their entire communications and collaboration environment, supporting the industry’s leading devices, networks, and applications from multiple vendors on multiple platforms. By unifying multi-vendor UC, SIP, and collaboration management in one solution, ReliaTel provides the ideal platform for organizations to cost effectively manage the quality, capacity, and service levels of the critical communications and collaboration systems that drive their business. Follow Tone on Facebook or Twitter and view the Tone Company page on LinkedIn.